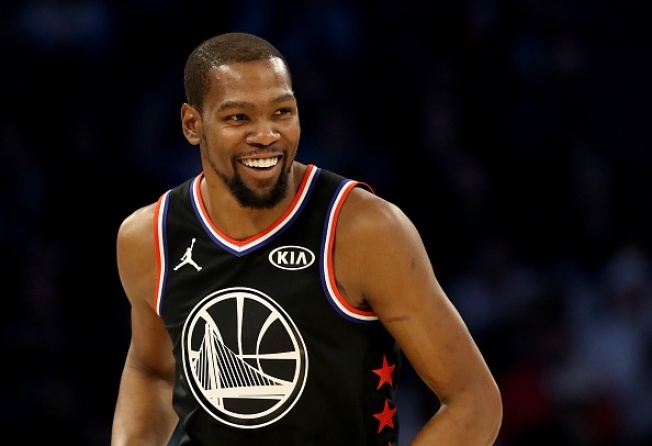 Out of all the stars on the court at the 2019 NBA All-Star Game in Charlotte on Sunday night, Kevin Durant shined the brightest. He, Klay Thompson and Team LeBron defeated Steph Curry and Team Giannis 178-164 in the annual showcase game, and when all was said and done, it was Durant raising the game's MVP trophy above his head. "All these players are great, you know," Durant said upon receiving the trophy. "We're mixing up the conferences, and there's so many great players in the league. So to be out here amongst so much greatness, I appreciate it." Team Giannis actually led by as many as 20 points in the third quarter, but Durant and Team LeBron staged a late comeback and dominated over the final 18 minutes of play. Durant accounted for a team-high 31 points on 10-of-15 shooting from the field and 6-of-9 from 3-point range, in addition to seven rebounds and two assists. "This will definitely give me some bragging rights, me and Klay," Durant said of Team LeBron's winning performance. "But Steph did hit that tough shot over Klay, so I'm sure we're gonna be talking about that for the next couple of days. "I'm glad I got the MVP, as well." It marked Durant's second time being named MVP of the All-Star Game, after he won the award for the first time back in 2012. He becomes just the fourth player in Warriors franchise history to be named All-Star MVP, and the first to do so since Rick Barry in 1967. "It's all sweet to me. It's hard to rank," Durant said of his All-Star Game MVP award. "Everything is special. But it was cool to be out there with the best players in the game. Keep trying to rack them up, I guess." If Durant and the Warriors continue on the trajectory they've been on ever since he signed with Golden State in July 2016 -- of course, his upcoming free agency could play a major factor -- he should have plenty of opportunities to add to that total in the future. Following the game, Durant spoke with the “Inside the NBA” crew about how he compares the current Warriors team to the ones that have won the last two NBA championships. "I think we're all a little bit more seasoned," Durant said. "I think we've been together for a couple years, and we know our tendencies and we know exactly what we need to do on offense and defense to compliment each other." Now that All-Star festivities have come to an end, the time for individual accolades has as well. Only 25 games separate the Warriors from the postseason, and despite winning All-Star MVP, Durant has much bigger goals in mind.